White gold is a favorite of many horse jewelry fans. Today we’ll be looking at this popular metal, and what you need to know before you add white gold horse jewelry to your collection. White gold is an alloy, which means it’s a combination of one or more metals. In its natural state, pure gold is the warm yellow hue we all know and love. However, when pure gold is combined with a white metal, you get white gold. The metals that are most often combined with pure gold to create white gold are nickle, palladium, silver, copper and zinc. Is white gold as valuable as pure gold? It’s difficult to put a value on all white gold as a whole. Much of jewelry’s value has to do with the design and artistry that went into creating the piece, as well as the value of any stones included in the piece. The best white gold horse jewelry, such as this exceptional 14K white gold 3 snaffle bit ring, combines exquisite artistry with the finest metals and beautiful diamonds. 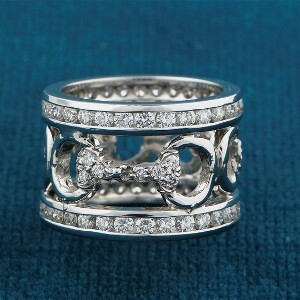 You can’t miss combining diamonds with white gold, and this ring would be a spectacular wedding or anniversary band. White gold can be stunning when featured in pieces the combine other colors of gold. White gold can be paired with pure gold, or rose gold, which is an alloy in which gold is mixed with a great deal of copper. Horse pins often feature multiple colors of gold, and a great horse brooch can easily serve as your signature piece of jewelry. What about white gold allergies? Many people worry that they’re allergic to white gold. Very few people are allergic to the gold in white gold – it is the other metals that are involved that can be problematic. If you’re sensitive to nickle, white gold can be problematic. Talk with your jeweler about the alloy used.